The Nigerian government has arraigned the wife of the Benue State Polytechnic lecturer, Andrew Ogbuja, for her alleged involvement in the death of 13-year-old Ochanya Ogbanje. Miss Ogbanje lived with the Ogbuja’s before her death in October, 2018, after being allegedly r*ped by Mr Ogbuja and his son, Victor, for five years. 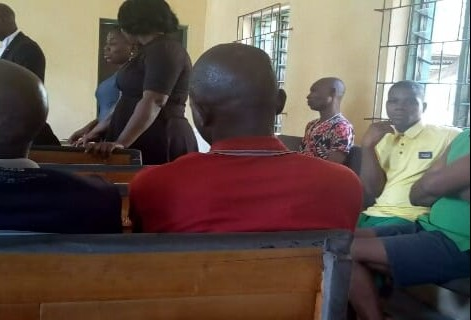 Mr Ogbuja’s wife, Felicia, was arraigned at a Federal High Court in Benue State for her alleged involvement in the events that preceded the death of the teenager. The National Agency for the Prohibition of Trafficking in Persons (NAPTIP) accused Mrs Ogbuja of aiding the r*pe of Miss Ogbanje during her stay at their residence. The agency had accused Mrs Ogbuja of allowing the persistent r*pe of the late victim to continue, through her silence after the crime was brought to her notice. She was arraigned on a two-count charge for the alleged offence. Miss Ochanya died of Vesico Virginal Fistula (VVF), an infection which resulted from years of s*xual abuses as a minor while she lived with the Ogbujas. How sad!